Finally, a sunrise. At first light I was lying in my tent looking at all the mosquitoes wanting in. It was a great relief to see the sun’s rays splashed over my campsite. It would drive them all back into the shade in a few minutes. I did not want to get too close to Donald Lake’s cabins and motorboats in the days travel so I enjoyed a long morning in a sunny camp. I had a little blister on the top of a toe that had become red and swollen so I took some time to soak it in hot water. I did not want something as minor as a blister to grow into a major medical problem. The soles of my old rubber boots had lost their grip so I replaced them. I used the new boots in my daily canoe carries that I used to get conditioned for the trip but I could not simulate the toe jamming steep declines. There were two canoes heading away from me when I finished a portage so I pulled over and fixed some lunch rather than be jostling them at the next portage. After a lazy lunch topped off by more fresh blueberries I headed for my next portage. It did not seem to have been walked on in a while. Even the cattails growing in the center of the portage showed no bruises. The canoe traffic must all come and go through Bulging and leave this passage to Donald unused. It appeared that I would be alone again until Donald Lake. There had only been one group per day for the last three days so it was not like I had been in a crowd. Funny how quick we get spoiled and would rather not even see one other canoe. I pushed through some reeds as I left the portage. They were making a racket along the side of the canoe. I was thinking about being the only one on this route, I cleared the reeds and the racket stopped just as I was having that thought. The sudden quietness and solitude was overwhelming. Between the two 70 meter portages there were a lot of potential campspots. The rest of the way to Donald I did not notice any. A lack of campspots often means good scenery and that was the case here. The closer to Donald the narrower the waters became. The last mile I had just enough water to get over the logs in the water. It was definitely the place for solitude. By the looks of the vegetation on the portages no one had been through lately. I wanted to camp before Donald but did not see anyplace. When I tried to find the 150 meter portage all I saw was a high rock wall. I backtracked and found the portage 368078 5649736 about 400 meters east of there. I was using an old park map that I had drawn in the new portages on. The 350 wet replacement from yesterday is not on the new map either so beware. I have camped at a nice site not far east from the portage.367980 5650153 It looks like it gets used for an occasional shore lunch but not much camping. Since I had made camp early I had plenty of time to go out and catch fish for my own shore supper. I have been frying up the fish first and then cooling the pan in the lake. I pour the oil back into a Lexon wide mouth bottle and put the pan back on high heat before throwing in the hash browns that have been rehydrating while the fish cooked. The fish is kept hot in a paper towel lined pan under the burner. The results are well worth the extra preparation. I rose before sunup for the first time of the trip. A full moon was still hanging in the western sky. The early morning waters were beckoning so I broke camp quickly and headed out. The sun was just rising over the hills and drenching the western shore with the kind of light that only a morning sun can produce. The birds seemed to be in an extra joyous mood this morning too, their singing traveled well over the calm waters. I paddled into a light breeze when I got to the bigger water on Donald. There was no activity until I neared the cabins and lodge on the north end. I stopped for a break on a rock near the mouth of Royd Creek for a break. I threw out the pink Dardevle and started fighting a fish I knew was too big to eat. It came to the surface and I could see that it was a thirty something inch Northern. A moment later the old wire leader broke and he was gone. Royd Creek is one fantastic route. It is wide enough and does not wander too much as it makes it way. At the first rapid I got out and pulled my canoe through several chutes. There were a few beaver dams and they had the water high enough for great traveling. The 375 meter portage was a little messy so I used my garden pruners to clean it up as I went back for my second load. 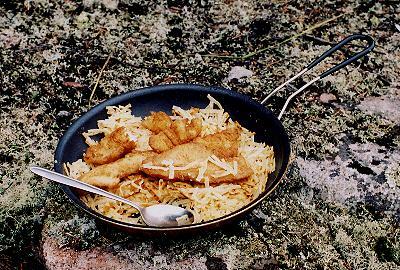 I fixed lunch on a rock at the end of the portage. A point nearby could also be used for a campsite. 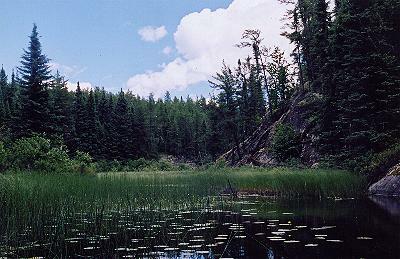 The route varied from small lakes to meandering stream. It is the most scenic creek I have been on in WCPP. At one point a duck and her ducklings were trying to stay ahead of me. When I thought they had finally hidden in the grass to let me by I was surprised to turn a corner and see mama on the high water side of a beaver dam and calling her brood over. The dam was quite an obstacle for the little ducklings. Eventually they were all back with mama and off they went. The little ones finally did hide and mama led me upstream like she was crippled. At an appropriately safe distance she received a healing, lifted off the water and banked around to find her little ones. Most of the lakes were shallow but when I entered Phillip it was a real gem. 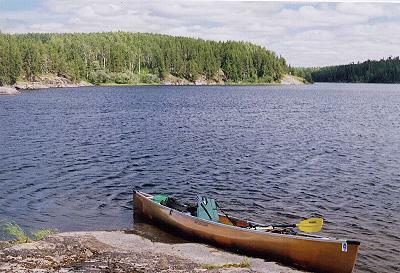 A beautiful lake with enough possible campspots to make a stay feasible. I finished the day with a flurry of portages near Royd Lake. We had camped at the site of an old rotted cabin near the creek exit from Royd in September of 2002 so I pulled in there mostly out of curiosity. I was surprised to see the firewood I had left 2 years before still there. The bugs were not a problem so I set up my tent next to the old cabin. This place is so different from the BWCA. I have seen people in the BWCA waiting in their canoes as you broke camp. Sometimes it was just to take any firewood that you had left for the next campers. 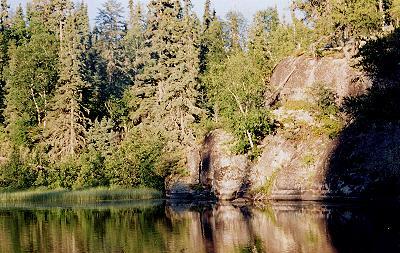 If you are tired of having to camp by noon to be assured of having a campsite give Woodland Caribou a try. Just think about it, it is the same size yet gets only one half of one percent the canoeist. The portages are all blazed and maintained too. After a refreshing swim I headed out on the lake only to find no one home. When we were here two years ago I remember Bruce and Ron "lucking into some trout." The story got repeated enough during the trip that the details were etched into my memory. Yeh, right between that island and that rock there is a dropoff. We jigged our Kastmasters and WHAM we had trout! With that in mind I put on the Kastmaster that Bruce had sent me and fought the wind to drift over the lucky spot. And then it happened, Wham and I was fighting a 23 inch trout! Ten minutes later I landed it and went to the island to fillet it. I was looking forward to a great meal and knew there would be no room for dessert. 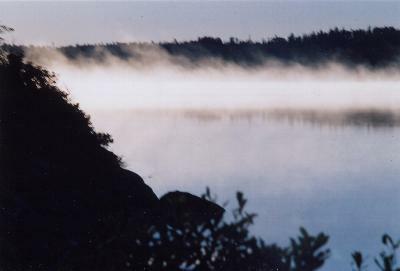 The morning dawned with another beautiful sunrise over mist covered waters. I secured the camp and headed out on an exploring adventure. While doing research for this trip on the internet I came across a reference to someone having taken a different route to Murdock Lake from Royd. He had gone through Constellation Lake and east on Royd Creek before heading north and hitting the established canoe route to Murdock. With that amount of knowledge about it I headed out. I always carry a GPS on my trips and compare the UTM coordinates to the 50,000 scale topo maps to keep track of where I am in the tricky places. Now the Garmin company has changed all that and made it even easier to keep track of where I am on the water. They have produced a 4 CD set that contains all of the topo maps for all of Canada. They are 50,000 scale except in the far northern regions. With these you can upload the maps for your trip into your GPS that accepts maps. Now when you turn it on out here your position icon shows your location on the map screen. In my exploring it will be a very handy tool to have along. As I headed toward Constellation I came across a nice little campspot for one or two people. 376369 5657350 It is small but good campspots are hard to find on Royd Lake and it has a very nice view. I pulled the canoe up a small rapids instead of taking a portage that is not marked on the map. When I did this I entered a new dimension in canoe county travel. Taking the road less traveled has always been my desire but now on Constellation Lake I am off the road. As I paddle south through an awesome passage I take a few strokes and then glide in silence on the glass smooth water. A beaver swims alongside having never seen a yellow log like this one. I know there have to be Caribou in those trees but again I fail to see them. I round a corner and see a marvelous campspot. Perched further up the rock is the blight of a fire ring. I pull over and take a minute to disperse the rock pile. I know that I am not the first to paddle these waters but those who follow will be able to imagine they are. I charged into the boulder field choking Royd Creek. I carried my pack to the water on the other side and then spotted a portage trail around the rocks. If my wilderness prow ness had been wounded by missing the portage at the lower end of the rapids it really took a blow when I walked the path back and found a raison box marking that end of the portage. 378858 5655674 Further on I pulled through some rocks and portaged around another rapids. 380507 5656764 I stopped for lunch at very nice campspot with a wonderful view of high rock walls on the other shore. 381112 5657181 The journey has worked out beyond my wildest dreams. There are still a few miles to go to the Murdock route but even if I can’t get through it has been worth it. At the end of the lake I managed to find an old portage. 381446 5657283 It was in worse shape than the others but could be followed to the other end where it dropped off a rock into the sphagnum. 381513 5657366 From this lake I headed north towards the Murdock route. I found blaze marks on the east side of the creek 381800 5657990 and set out with my canoe and pack into the sparse spruce forest. I lost track of the blaze marks a few times but would continue on and spot them again. After 150 meters the portage crossed the creek and then it was blazed often and the track in the sphagnum showed better. There was a lot of down timber but it was easy to step over or go around it. The portage came out on a little pool in the creek. 381494 5658479 This portage is about 700 meters long. At this point I knew there had to be one last portage to the Murdock Route. The trouble was that it looked on my GPS screen like it could be in any of three places. I was relieved to see no rock walls blocking my first choice. I was really pleased when I saw old blaze marks on a tree at the waters edge. 381723 5660176 I saw some blaze marks ahead and headed in with my canoe and pack. It was treacherous slow walking in the deep moss. 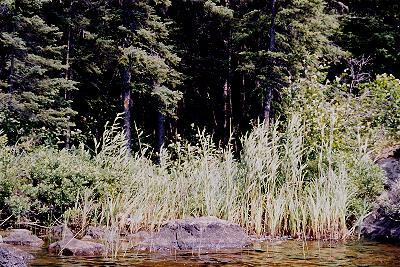 I stayed in the bottom of a narrow valley and after 10 minutes of slow slogging in the deep sphagnum I emerged on a lake 381694 5660450 in the regular canoe route from Royd to Murdock. I had spent 8 hours on the journey but I had really dawdled along the way. I figured I could have turned around and gone back in 4 hours. In the end I wish that I had. I was looking forward to whizzing along on my way back to my camp on Royd through the nice maintained portages. A recent windstorm had changed all that. My first four portages were covered with down timber. It was so bad in places that tape had been hung so that you knew which way to go. When I got through the area and headed south I let the wind carry me back to camp while I looked for Caribou. My GPS told me that the wind was pushing me at 2.6 mph. Yes, they are quite a gadget.